We first mentioned to "leave no one behind" during our CAP on a Map work in the Maldives; that was ESCAP's event theme, this past week. 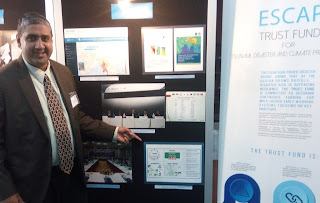 Spot-On was invited to contribute to the discussions on the multi-hazard expert group forum. It was an event of the UN-ESCAP Resilience Week; combining with the Fifth Session of the Committee on DRR and launching of the 2017 Asia Pacific Disaster Report. The event presented data pointing to evidence that multi-hazard warning systems have minimized the loss of lives but the economic losses are still rising. That is an indication that the multi-hazard warning systems are functionally incomplete; i.e. stakeholder losses are not used as an EWS reliability measure. ESCAP investment, to date, has been on the sensor, detection, and decision subsystems, of a functional Early Warning System (EWS). ESCAP perceived that those investments were high impacting and returns from a regional overlook. ESCAP might consider stretching capacity development in the other necessary subsystems too. The ESCAP multi donor trust fund has spent USD 15 million in mobilizing RIMES, ADPC, and other Partners/NGOs to facilitate the development of the EWS sensor, detection, and decision subsystems. Sahana was the first to provide a broker solution that interlinked the decision process with the response. Sahana Alerting and Messaging Broker implementation (SAMBRO), through the CAP on a Map project, for improving institutional responsiveness to coastal-hazards in Maldives, Myanmar, and the Philippines, was an investment of the multi-donor trust fund. There is a need for an organization such as ESCAP to take inventory of the reliability, not just the status, of the entire end-to-end chain. ESCAP/WMO committee addressing this issue, might consider the Axiomatic design for realizing system complexities, map the operational orientations, and measure the Markovian properties. These suggestions slightly overlap with the OECD methodology. Some gaps can be realized from the WMO country profile database and by applying the, WMO recommends, OECD criteria for evaluating development assistance. Another recommendation was to link it to the SDGs. Such a metric would allow for identifying where investment are need for delivering minimum viable products to plug those gaps. These indicators would also set benchmarks for attaining impact-based multi-hazard early warning capabilities. It would also identify where cooperation needs to be facilitated. ESCAP/WMO might consider placing the Common Alerting Protocol (CAP) international warning standard at the helm in support of transboarder early warning. It removes the need for bi-lateral warning sharing agreements between member states or institutions. Instead use the CAP Real Simple Syndication (RSS) specifications with clear instructions for implementing and begin publishing warnings. Then other systems can poll from those external CAP warning Brokers. IOTWMS, RIMES, Typhoon Committee, and Panel on Tropical Cyclones should become roll models with integrating CAP in their programs and services. Such CAP feeds would, eventually, contribute to the WMO Global Filtered Alert Hub; whereby, anyone could subscribe to location, language, and event specific CAP messages. The next Multi-hazard EWS challenge was with downstream hydrological forecasters wanting upstream transboarder data to use as inputs in their modeling algorithms; specifically for nowcasting. The political orientation with the usual prisoner's dilemma games are unwilling to share data. There were recommendations to make that a voter indicator to stimulate the political will. Nevertheless, it is possible to share information. 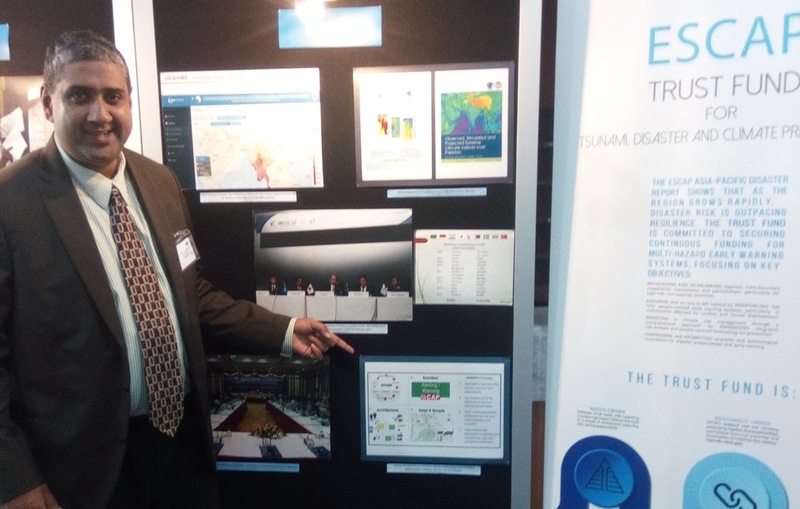 The Asian and Pacific Center for the Development of Disaster Information Management is being developed in Iran with the help of the Iranian Government. The Center might consider facilitating such interoperable information that one could become the inputs to be used in downstream modeling algorithms. LIRNEasia and Sahana Foundation might consider sharing their knowledge with the Center to develop useful products and services. The Center comes under the Asia and Pacific Resilience Network (APRN). The intent of APRN was unclear. However, it might complement the efforts of others like ADRRN. There are established partnerships that are fostering data sharing such as ICIMOD in the Hindukush mountain region and Mekong River Commission are sharing data for flash flood forecast. It is standardized based on the ESCAP Guidance Document. Another was a recommendation to adopt TC/PTC best-practices. All of those are contributions to fostering corporation in hydrological data sharing.